All of us at Stone Barns Center were deeply saddened by the news that David Rockefeller, our founder and the co-chair of Stone Barns Center’s Board of Directors, passed away on March 20, 2017. 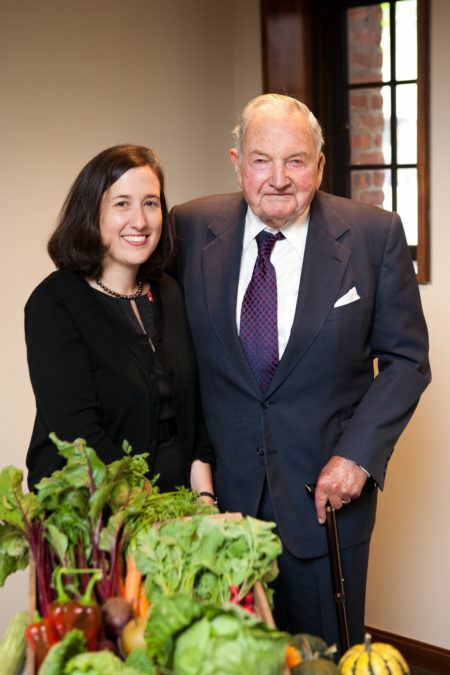 Mr. Rockefeller was an amazing man and a beloved friend to many of us here at Stone Barns. Over a decade ago, he co-founded Stone Barns Center with his daughter, Peggy Dulany, and her siblings on land that had been in the Rockefeller family for more than a century. Together with conservation planners, organic farmers and many others, they came together to set a common vision and purpose for this land. They hoped to preserve its rich agricultural heritage and reintroduce to the community the many benefits that farming and farmers bring to a place. Their goal was a working farm practicing resilient, transparent, four-season agriculture and open to the public as a hub of learning, creativity and experimentation. They envisioned a place where people could connect with the land and farmers; a place that would help inspire people to grow and eat sustainably produced food. Their vision also included our unique partnership with Blue Hill at Stone Barns, a nonprofit and for-profit working together on the same campus to demonstrate the concept of an ecological cuisine—seasonal and regionally appropriate food grown and raised in harmony with the ecosystem of which the farm is a part. With Mr. Rockefeller’s leadership and philanthropic support, the buildings at Stone Barns were renovated to transform this place into what is today: a vibrant campus for educating young farmers, students, teachers, chefs and other change makers dedicated to building a healthier food future. Together with his children, Mr. Rockefeller’s vision, convictions and commitment laid the foundation for both Stone Barns Center and our partner restaurant, Blue Hill at Stone Barns, to become the forces for change that they are today. His original investments and ongoing contributions have inspired more than 6,000 others to support Stone Barns Center’s work, as well. And this is only one of the many projects that he supported to build community, exchange ideas and create a better world.